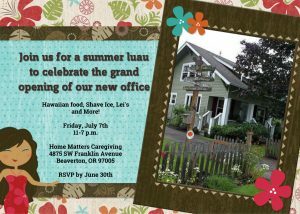 Join us for a summer luau to celebrate the grand opening of our new office. The event will have Hawaiian food, shave ice, LEI’s and more! It will be an all day event on July 7th. For more information, please contact Christina Foutch at christinaf@homematterscaregiving.com.